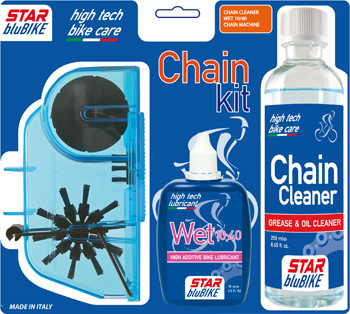 Bicycle cleaning and lubrication set. Chain Kit is made up of Chain Machine, for cleaning the chain, Chain Cleaner degreaser and Wet 10.40 lubricating oil. Bio set for bicycle lubrication and cleaning. Bio Chain Kit is made up of Chain Machine, for cleaning the chain, biodegradable Bio Chain Cleaner degreaser and Bio Lube biodegradable lubricating oil. Bicycle cleaning and lubrication set. 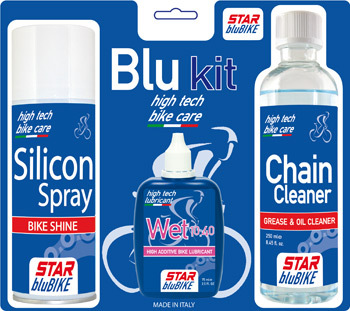 The Blue Kit consists of the Silicon Spray Protective Spray, Wet 10.40 Lubricating Oil, and the Chain Cleaner degreaser. 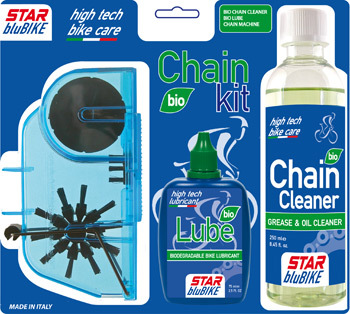 Bicycle cleaning and lubrication set. 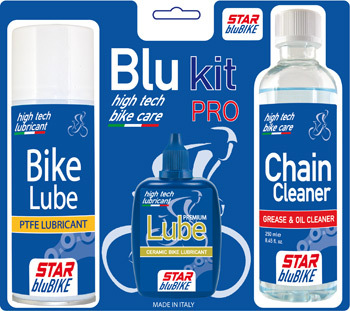 Blue Kit is made up of high quality spray lubricant, Bike Lube, Premium Lube synthetic oil, and Chain Cleaner degreaser.